Rub the salmon with sea salt and ground black pepper, leave to marinate for 30 minutes. Heat up the oven at 200 deg C for 25 minutes. Off the oven heat. Place the salmon on the baking sheet with lots of olive oil and leave it in the oven for 30 minutes. the salmon fillet will be just done . * If you want the salmon to be more cooked then put it in the oven 5 minutes earlier before you off the oven heat and leave it in the oven for a bit longer time. Meanwhile cook the spaghetti in hot boiling water till al dente. Drain dry and leave aside. Heat the non stick pan with the olive oil, saute the garlic till fragrant, add in sea salt to taste and the chopped italian herbs, stir fry for another 3 minutes, off the heat and add in the cooked spaghetti and stir till the spaghetti are coated with the garlic herbs olive oil. 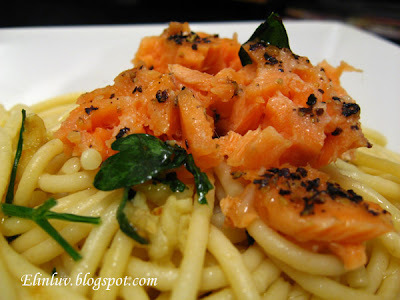 Dish up and garnish it with the black pepper salmon. my girl saw.. she asked why no chap.. hahaha.. normally the spaghetti she ate got red chap.. eh.. the sea salt is expensive.. i think i can try this recipe.. olive oil? sounds easy.. see i can do or not.. cos i used to buy salmon for my girl, i normally grilled with black pepper in the oven only..
Actually, if the ingredients are fresh, simple is better :) Let the natural flavours shine, which you did :) Your other half is very lucky indeed. Simplicity is deliciousness, Nigella Lawson. Looks great. I love simply dressed pasta. 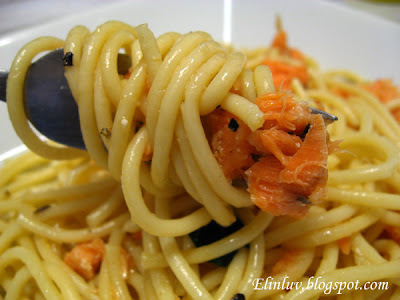 Spaghetti with black pepper salmon...Elin, you for sure knows how to treat your family! I think I'll try this out, no cheese, if I'm not mistaken. Looks delicious. looks soooo delish, and yummy too! 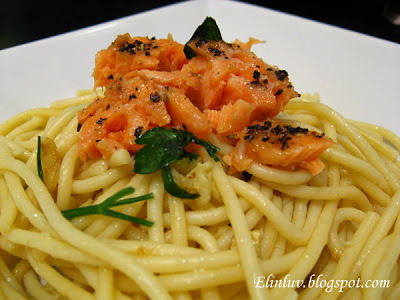 will make this for dinner tonite, hopefully it will turn out as well as yours..... thanks ALOT for sharing! 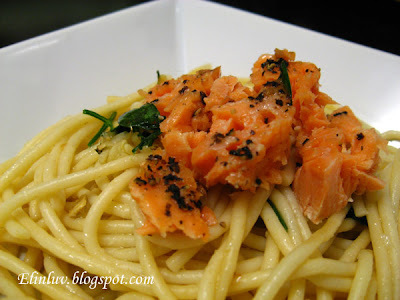 I love simple dishes especially when it comes to pasta..love that baked salmon! Salmon is tops on my list. 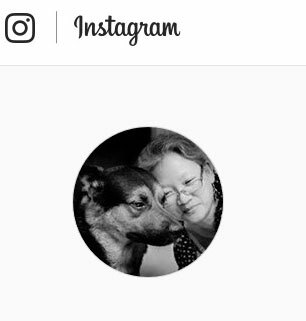 I'm always looking for new recipes. This looks like a keeper. Easy and delicious! What a great recipe. Thanks for sharing! Love the simplicity of this! Salmon is one of my favorites!! This is a nice simple recipe packed with great flavor! @ Kenny T : I totally agree with you! @ Olive : Hi Olive :) thanks...the salmon was just cooked. I like it just cooked, still juicy and delish! 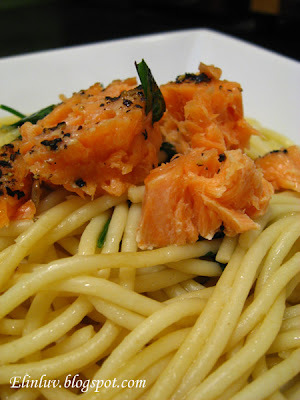 Salmon and pasta are both family favorites, but I never combined the two. I am totally making this!!! What a lovely way to prepare salmon! A simple preparation is always best.